I’ve always been one of those people that has struggled with their skin. No matter what products I’ve tried I have never really found a way to clear it. Over the past year I made changes to my skin care routine and other areas of my life that have made a massive difference. I made obvious changes to my lifestyle, I exercised and drank more water. Since moving though I haven’t been able to exercise and I think the winter months don’t help my motivation. I do try and drink as much water as I can though, I make sure I have some on my desk at work. I also switched the Yasmin, which is the best pill for your skin. So far so good, I’ve read lots of people with differing experiences though. Skincare and diet have made the biggest differences for me. 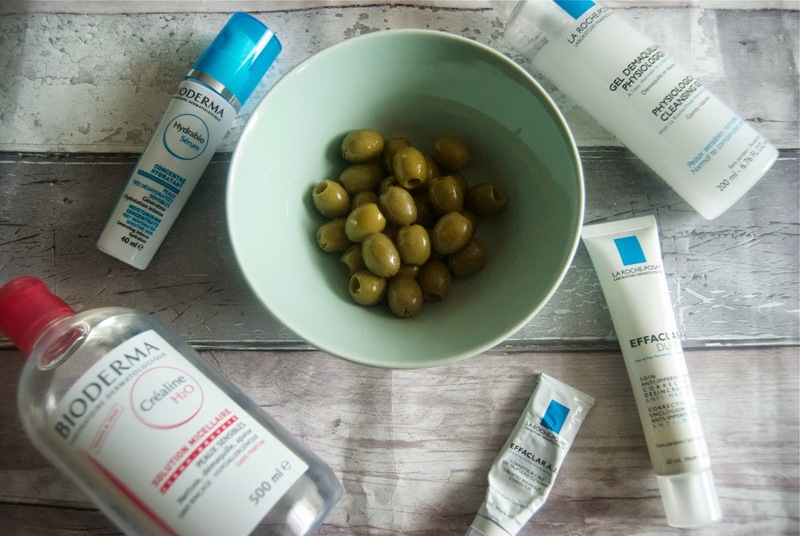 It might sound strange but eating more olives have made a big difference to my skin, well I certainly think they have. Olives act as an antioxidant and are a great source of vitamin e. Adding these into my meals helps to give me skin a healthy glow. The rest of my new found healthy glow is down to a different combination of products. First of I ditched the make-up wipes after many years of lazy wipe use. If I can pass on any knowledge to anyone reading out there, it’s to ditch the wipes! They just push the make-up and bacteria around your face. I switched to Bioderma’s Solution Micellaire water and haven’t looked back. It gets off all the most stubborn make-up and prepares my skin for my next step. I’ve banged on about this next product enough. La Roche Posay’s Gel Cleanser is a product I cannot live without. It’s such a gentle formula and leaves your skin feeling squeaky clean without that tight feeling. At the moment I’m switching between two moisturisers for day and night. Effaclar duo is the perfect base for under my make-up, I apply this all over my face rather than focusing on red areas. On a night I apply Bioderma’s Hydrabio Serum which is great for re-hydrating your skin. I love leaving it to soak in on a night. Lastly La Roche Posay’s Effaclar AI targeted breakout corrector is a little miracle in a tube. I apply this to my blemishes day and night and they never actually make it to the surface! "Event: Transfer Pop-up T-shirt Factory"